Wes has been a long-winded talking machine recently – and especially all day today. Super duper cute! I love our green couch and love seat. So much happens there every day. 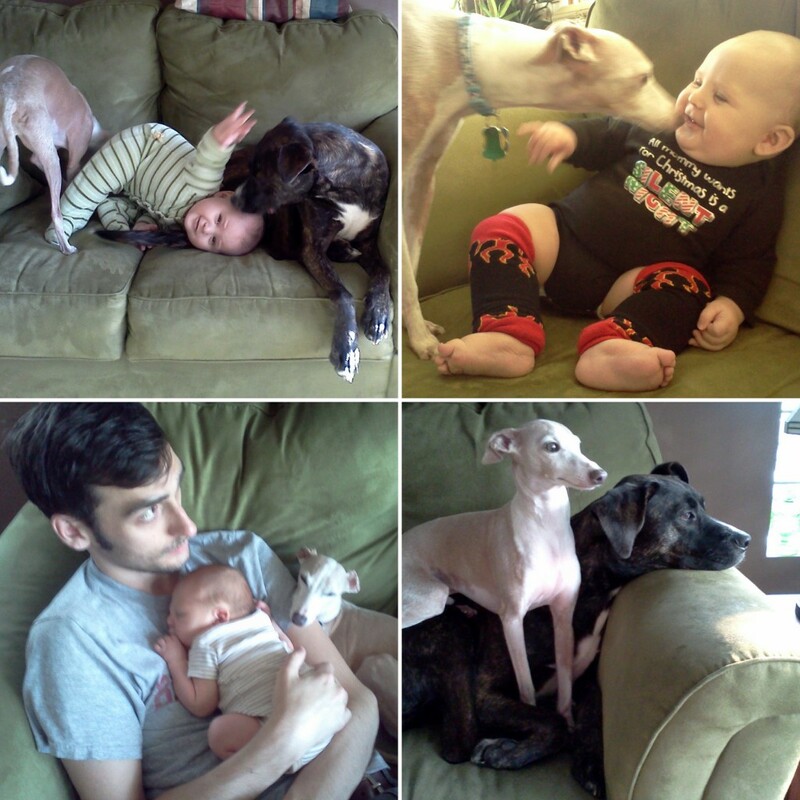 We may be terrible in that we let our dogs lounge all over the couch, but it’s their domain. We spend a lot of time on those couches – eating, reading, playing with Wes, snuggling, fighting sickness and sleeping there when contracting every 10 minutes. The couch is in every other photo taken, it seems. Photos taken when friends visit feature the green couch. We’re sitting, chatting, playing a board game or posing for a group shot. When Wes has a monthly milestone and it’s photo time, we usually start out from or end up on the green couch. The green couch is now 5 years old. We purchased the set with leftover wedding money, and I remember squealing when I saw it. My favorite color. Green is the color of growth, new life and new beginnings. My eyes are sometimes green (when I’m wearing green). My birthstone is an emerald. Frankly, it’s a pain to clean. Microfiber picks up everything, including dog hair and dog smells. It has its share of cookie crumbs, spit up and slobber embedded deep within the fabric. (It does get a deep RugDoctor cleaning every so often.) I knew it would become outdated quickly, since it wasn’t brown, leather or plain. But we got it anyway. I’m so glad that Wes will have “that green couch” in all of his baby photos. So many memories are made on that piece of furniture. 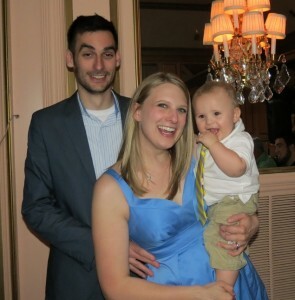 If you follow @StevenShattuck, likely you’ve been itching for the details about Saturday’s wedding. Jordan is one of my closest friends from elementary through middle school. Freshman year at Ball State, by chance our dorm rooms ended up two doors down from each other. That year was filled with laughter, impromptu “movies,” music videos, discovery and just plain old fun. Her roommate, Laura, was another friend from middle and high school days, and combined with my bestie and roommate, Rachel, the four of us were always finding something exciting to do in Muncie. 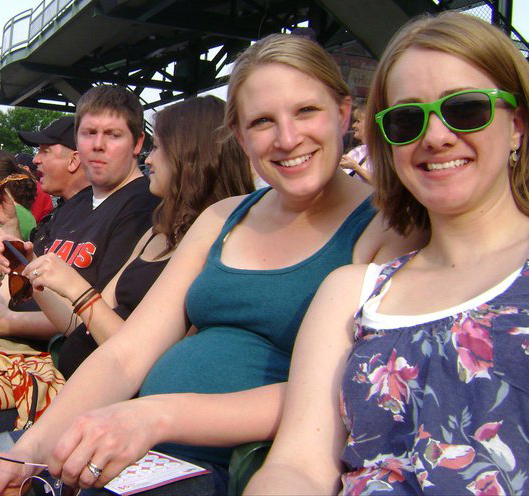 Jordan transferred to UT the next year and Laura and Rachel both left BSU the following year, so we look back on those days with fond memories. Even the distance from Tennessee to Indiana doesn’t keep us from seeing each other at least once a year. J is my gal-pal, and when she giddily told me about this guy named Matt, I knew I had to meet him. They came to visit around this time last year, and I got to witness the true, innocent love shared between Matt and Jordan for nearly a week. I was pregnant and swollen and secretly hoping that Wes would be able to attend their wedding. Sure enough, just a few short months later, I got a phone call and photo text of a beautiful engagement ring. Jordan asked me to be her matron of honor, and what an honor it was! Wes was a star. He was happy and pleasant the whole trip – even during the unexpected 1.5 hour detour, which made Steven madder than a hatter. He slept and napped well. He sported many smiles. Getting the Pack n Play set up was a struggle, however. The bruises all over my wrists are a lovely shade of blue. Must practice more. Steven was great, too. He pretty much babysat Wes so that I could have fun. I’m sure Matt would have liked Steven to be around more, so next time I think we may leave him with Grandma. Note to self. 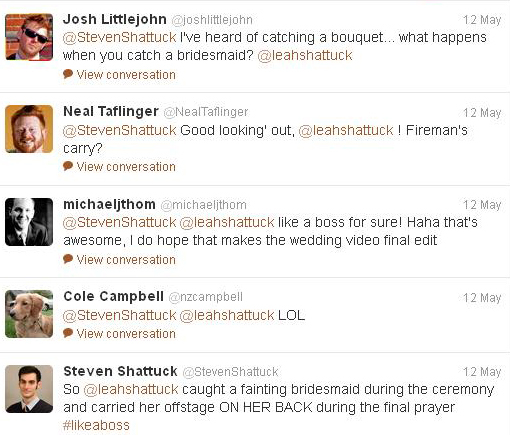 Laura, mentioned above, was a bridesmaid, as was Hayley, Jordan’s 15-year-old niece. During the rehearsal, we kept teasing each other about the possibility of fainting during the ceremony. 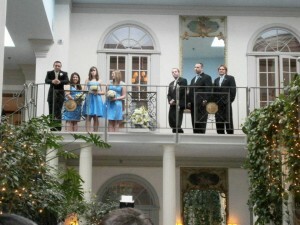 You must realize that the ceremony and reception site was absolutely beautiful, but the balcony where the bridal party stood had little ventilation. It was down right hot up there. Laura giggled that she’s never been to a wedding where someone DID faint, but that it’s largely talked about and witnessed on youtube and the like. Wouldn’t it be fun to attend a wedding where someone did? Once we were all in place and the floor was marked with tape where we were to stand, Laura and I jokingly told Hayley that if she needed to faint, she could lean forward on me or backward on Laura. We had her back. Good thing, too. Now, I only tell this story because Hayley is fine & well and able to laugh about it now. Serious kudos to her for taking it lightly! Everyone – well, nearly everyone – had their head bowed in prayer, which was great timing for all of the following events to happen. The bridal party were all turned inward to face M&J, and in the next moment, I felt Hayley’s chest on my back. She wasn’t kidding! “Ok, we got this,” I kept telling myself. I bent my knees and leaned far forward to absorb her weight as she indeed passed out. Laura wrapped her arms around Hayley so she wouldn’t fall to the side. It was a sight to behold, I’m told. After a few long moments, she stood up straight and gasped. The prayer was still going strong, but I think that’s when a few family members and a couple ushers noticed the scene. Hayley said next, “I’m going to pass out again. I need to sit.” And almost instantly, she started to fall backwards into Laura. Her pretty face was getting paler by the minute, and we needed to make a quick decision. Team Laura/Leah sandwiched her again, and by the grace of God, an usher appeared on the opposite side of the locked french door behind us. He quickly opened it, and thankfully there was a couch right by the door. We laid her down and fetched orange juice. The prayer ended just as we got her settled! Surely Jordan was slightly confused why her bridesmaids disappeared! I’m confident this event will get funnier and more dramatic as the years go on, and I sure hope they can embellish it to make a very unique and entertaining wedding story. So, Laura in fact, DID get to witness a fainting bridal party member! I doubt any one got footage of this encounter, and it truly is a shame. We were hailed as “the best bridesmaids in the world” by several wedding attendees throughout the night, and one even joked that he thought we were just “feeling the power of prayer” as our bodies bent in every which way. The rest of the night went smoothly and was a lovely time. Matt and Jordan are meant for each other. Their love is sweet, sincere and full to bursting. It certainly is a wedding I won’t soon forget! 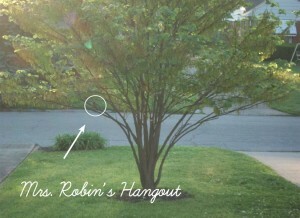 It feels like such an honor to be chosen as the residence for a little robin family. 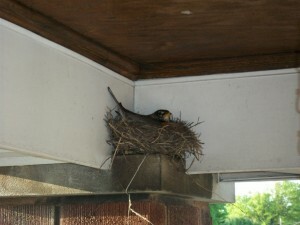 I discovered the nest on our porch nearly two weeks ago, which was still in process at the time. I immediately squealed with anticipation. I mean, how often do you get to be that close to a mama bird and her babies? 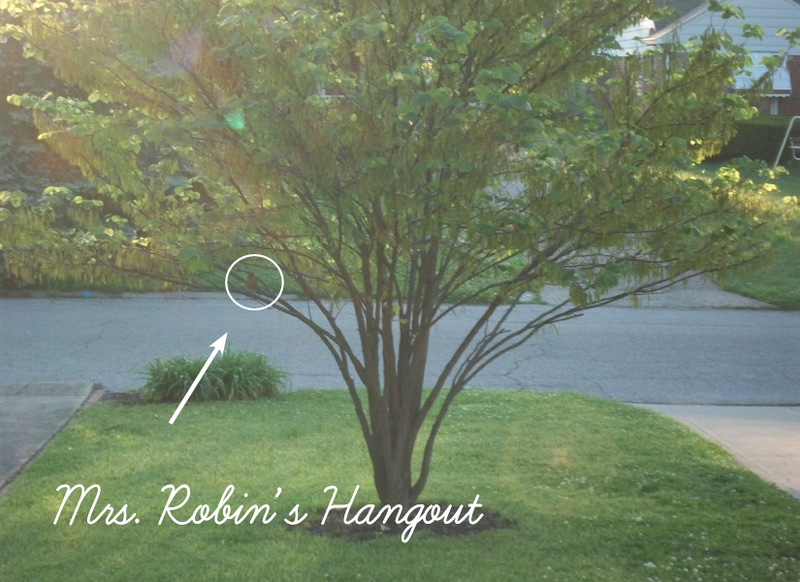 She hangs out in our front yard redbud tree – a great escape, yet close enough to keep an eye on her porch-home. Usually she flies there whenever a door opens, closes, a car passes or the mailman comes to the porch. 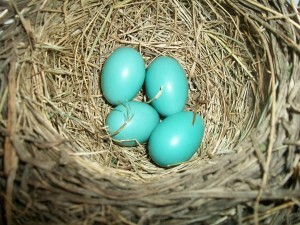 I used to worry about those poor baby birds… what if Mrs. Robin got too scared to come back to the nest? But the last few days, there have been terrible rain and thunder storms. She has spent more time than ever cuddled in her nest. 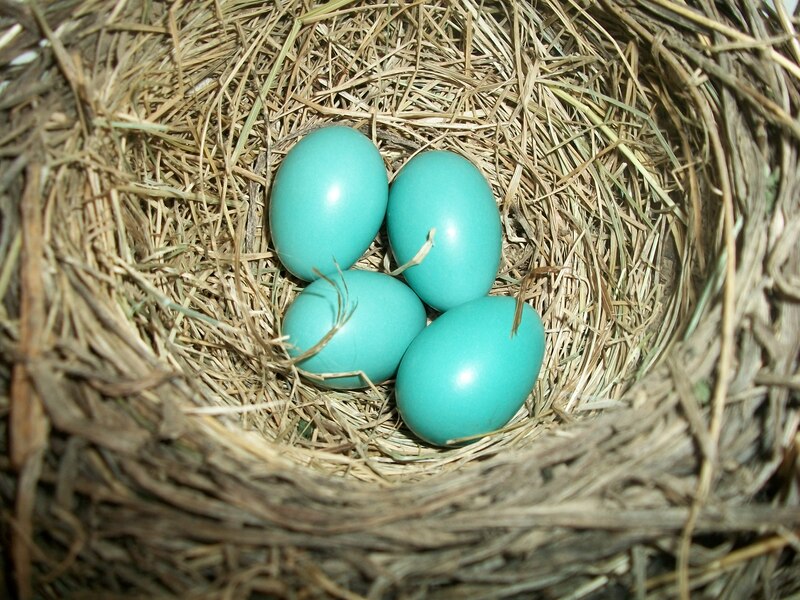 I’ve peeked in a few times, and as of this morning, there are four perfect, baby blue eggs just waiting to release new life. Aren’t they beautiful? Seriously. I can’t wait for the next few weeks as little babies emerge from those shells. It’s amazing how mothers of all shapes and sizes know exactly what to do to care for little ones.